Bexhill United Football Club made a very good side look very average according to manager Ryan Light in Saturday’s 1-1 draw at home to AFC Varndeanians. 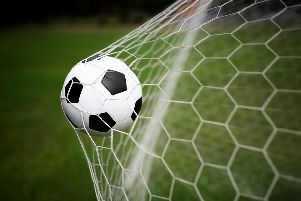 The Pirates took a 71st minute lead in the Southern Combination League Division One third versus fourth encounter only to be pegged back by an equaliser 10 minutes later. Light said: “It’s two points dropped, without a doubt. I thought we made a very good top four side look very average - that’s nothing against them because they’re a good side, but I thought we were top drawer. “I thought once we were in front we would add to it, but we switched off just for a moment and it’s ended up in the back of the net. The draw was the first point Bexhill have picked up against top four opposition this season after four 1-0 defeats. “We’ve been the better side in all of those games,” continued Light. “Probably the only one where we wasn’t the better side was the first Varndeanians game (Bexhill lost 1-0 at the Withdean Stadium on the August Bank Holiday Monday). “I thought today we totally dominated. We started the second half well, and just kept the ball so well and looked so tenacious at winning the ball back. “I thought there were some outstanding performances - Lewis McGuigan, Kyle Holden, Drew Greenall up-front was everything you want from your centre-forward, Jack McLean again I’ve not seen a better player in this division this season. Bexhill’s goal was scored by left-back Nathan Lopez, an unsung but consistently impressive performer in a side enjoying a decent season. “He’s consistently brilliant,” added Light. “He’s just phenomenal at times. I’ve not seen a left-back at this level with so much energy. Southern Combination League Division One top half standings (played-points): 1 Steyning Town 20-55 (+33 goal difference), 2 Alfold 19-45 (+36), 3 BEXHILL UNITED 20-44 (+39), 4 AFC Varndeanians 19-39 (+26), 5 Selsey 20-35 (+18), 6 Hailsham Town 20-32 (+9), 7 Seaford Town 19-28 (-3), 8 Littlehampton Town 19-27 (+1), 9 Billingshurst 19-27 (-2).